I like duality deities. I don’t know why, I just do. Perhaps it’s just true, opposites attract. All those creation/destruction deities just float my boat. So you can understand how excited I was when I discovered Tlazolteotl. 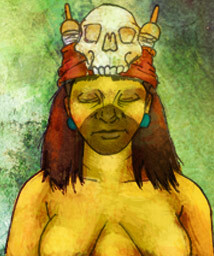 Tlazolteotl is the Aztec goddess of purification and filth. She gets you dirty, she gets you clean. Dirty, as in disease, dirt, and vices like gambling or adultery, and clean, as in steam baths and forgiving disease caused by misdeeds, particularly of a sexual nature (wink, wink). Tlazolteotl is a patroness of adulterers and midwives. I like this lady, she’s loaded with opposites! She inspires desires and forgives you when you indulge in them. Nice, right? Tlazolteotl is sometimes depicted wearing the skin of a human sacrifice, a headdress that has a spindle of cotton, and carrying a grass broom. Other times she is naked and squatting, as if giving birth. Through a priest you can confess your sins to Tlazolteotl, who will forgive them (she is known as She Who Eats Sin). There is a catch, unlike in other faiths that feature confession, you can only confess to Tlazolteotl once in your life. So you had better save it for a real doozey or when you’re very old!